A reviewer once said rather cynically that you could always spot the American authors of educational books by the ‘PhD’ that invariably appears on the cover. There is no such qualification on the cover of Sue Roffey’s book, but I had not read many pages before I checked to see where she was based, as I felt it was unlikely to be the UK. Sure enough, she is writing from an Australian perspective, and the book builds very much on the pioneering work of fellow Aussie Bill Rogers, who writes the introduction. The reason I bring this up is that it signifies the difficulty for UK teachers who adhere to the kinds of values Roffey espouses in this excellent little book. I have said many times that we have in this country a cultural antipathy toward any sort of discussion of relationships and emotions in education – its ‘girly stuff’ – and for me this book brought that problem sharply into focus. It emphasises the importance of relationship in teaching but not in a woolly being-nice-to-the-kids sort of way; quite the opposite in fact. The structure of the book parallels the experience of growing up in that it starts with an examination of the self, using questions to aid the process of discovering the readers values and beliefs, then moves to examine the inner resources you possess, your relation to the class, the school and the wider community. The first part of the book is very much ‘big picture’ thinking and quite rightly; far too many behaviour management books in the UK ignore the wider context, and particularly the development of healthy relationship between teacher and child. Roffey says ‘a strategy is only as good as the context in which it is embedded and the most powerful aspect of context is relationship.’ She refers to research which evidences the effectiveness of her approach (where’s the research?’ is always the first question asked by those who are suspicious of anyone whose values appear to be even vaguely child-centred). The book is clear, easy to read and full of solid guidance about what to do even in the most difficult situations. This includes changing jobs if the school is unsupportive of what you are trying to do (although emigrating to Australia might be a little extreme – there are some enlightened UK schools!) It also includes keeping a sense of perspective – I liked the anecdote about being stuck in Spain and asking ‘how important will this be in six months time?’ If only some senior school managers could ask themselves that one; schools might be a little more relaxed more often. Self-management is an important part of surviving a difficult working environment – another small but powerful tip Roffey gives is to learn to manage your emotions by stepping outside of yourself and watching yourself as if you were in a film. I use this technique frequently myself and it really does work! As I have said, the second part of the book details specific strategies about what to do with challenging students, down to use of body language, tone of voice, what to say etc. This borrows quite heavily on some of the positive approaches to parenting I have read and Roffey refers to one such book in her ‘further resources section. Each chapter is usefully summarised and there is a comprehensive summary of the whole book at its conclusion, in the form of ‘do’s and don’t’s’ – this could be enlarged and photocopied (with the publishers permission of course!) and stuck on a wall as a daily reminder. There used to be a saying which ran ‘no curriculum development without teacher development; no teacher development without personal development’ and this is really the basis of this book. It’s a shame that in the UK we seem to have lost sight of such wisdom, but those teachers who are still gamely hanging on in there would do well to read this book, if just to remind themselves a)why they became a teacher and b) that they are not alone. Country Walks Near London Volume 2 . Published by Time Out. 2004. Cover price: £12.99 (Royalties are devoted to the Institute for Social Inventions charity). 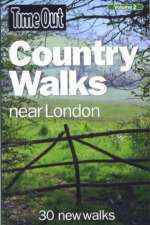 In Autumn 2004, ramblers throughout Britain were looking forward to the new right to roam, while walkers in the South East had an equally significant event ‘in the offing’– the publication of Volume 2 of Time Out’s Country Walks near London. Owners of Volume 1, published in 1997, will already have appreciated well-researched and graded walks, which begin and end at railway stations. The new volume continues this tradition and includes many improvements, such as colour illustrations and features on sites of historical interest. This makes it an altogether more readable book. The thirty new walks, from 7 to 13 miles in length, are described in considerable detail, with lots of options for shortening or varying the route. Several lunch and tea places are included. Instructions on transport and timings are clear and comprehensive. Compass bearings are given at critical points. To test out the book, I chose an 11mile linear walk from Petersfield to Liss in Hampshire, an attractive area but one that is relatively unknown to me. The walk in the morning promised spectacular views from the top of the Shoulder of Mutton hill and I was not disappointed. I also enjoyed learning about local poet, Edward Thomas, who died in WW I and whose memorial stands on the hill overlooking Steep where he lived. There were other encounters with locals, notably the delightful lady out for a walk with her two cats, who were exercising their right to roam on top of the hill. I wonder if they all arrived home safely. Lunch was taken at the Hawkley Arms in Hawkley - good beer and good food in a totally unspoilt village pub. In the afternoon, the walk continued through woodland and farmland, pleasant enough, but not as scenic as the morning. Being a fairly fast walker, I arrived at Liss slightly within the time suggested, feeling pleasantly tired after a good day out. The distance walked, with one steep climb and the odd patch of mud, probably justified the 7 out of 10 toughness grade given. My only minor quibble was the absence of interim distance indicators. As walk leaders will confirm, everyone asks if the pub is halfway! The walk was documented in such detail that I could have dispensed with my OS map. However, I did encounter one new fence, which shows that features change, even in the short time since the book was researched. The advice is always to take a compass and map, in case you need to check the route. Motivation to avoid baldness is not confined to modern times. In 1150 BC Egyptian men smeared their pates with fats from ibex, lions, crocodiles, serpents, geese, and hippopotami. For more than two millennia, therefore, hair loss has been a subject that is disturbing to most people at some stage of their lives. Inevitably, perhaps, it is most worrying to younger men and older women, mainly because it affects most older men and few younger women. But these are by no means general rules and Vera Peiffer has drawn largely on her own traumatic experience at the age of only 14 when hair loss dramatically struck and treatment served very little more than to increase her state of stress, which itself aggravated the condition. So in writing this book she is offering no prescriptions that have not been put under the microscope of her own experience. Peiffer has written a portmanteau book – which is none the worse for that. Indeed, it is a major part of the book’s success (and success it is!) that it does not merely address the issue of hair loss from the cause, effect and remedial bases, but addresses health and wellbeing in general, from the vantage point of stress, since this, in Peiffer’s estimation, is largely responsible for hair loss. This is not really a surprising conclusion. Negative stress, that is anxiety, as opposed to positive stress, tension, will have a profound effect on body, mind and spirit. If we are suffering from any form of physical complaint, worrying about it will aggravate the condition. So it is good that Vera Peiffer has devoted a large part of her book to anxiety and how to deal with it. 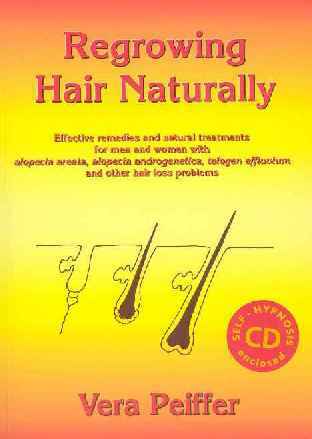 Indeed, the copy of the book that I have includes a CD for self-hypnotic relaxation as an aid to hair growth. Actually I cannot think of any aspect of hair loss, treatment, recovery and the physical and emotional control of body and mind associated with hair loss, that has been neglected in Peiffer’s book. She deals with the causes, types and conditions of hair loss in the first part of the book; conventional, complementary and alternative forms of treatment in the second part of the book, and a final section covers a whole range of ways in which sufferers can be helped and can help themselves to feel better about the condition. And it is wonderful to find a book dedicated to helping sufferers and not simply to separating them from their cash by offering patent remedies. In Life’s Currency, the late, wonderful Winifred Rushforth wrote: "The art of living must, I think, consist in finding the right balance between I want and I ought in our lives. Tension is inevitable between them, but tension is creative." So it is that in dealing with the effects on hair loss of negative stress, Peiffer pays inadvertent tribute to the Rushforth statement. As an example, dandruff, or seborrheic dermatitis which can lead to hair loss, can indeed increase with stress -- regardless of whether the stress is caused by a negative event, such as losing a job, or a positive one like getting married. It is not the event in itself that is the culprit, but the individual's response to that event. Hair plays a significant role in our life. Another person's hair is one of the first characteristics we notice upon meeting. Our own hair is one of the first and last things we attend to before a meeting or a social engagement. Hair disorder, especially when severe, often profoundly affects the lives of those afflicted. Severe hair loss evokes not only cosmetic concerns but may also evoke feelings of vulnerability (nakedness), loss of self-esteem, alterations in self-image, and, perhaps, even self-identity. Altogether a matter of concern to millions of people who suffer the condition in greater or lesser form and endure the complaint with varying degrees of equanimity or neurosis. There are thus millions of potential readers who could benefit from the Peiffer prescriptions and if this book reaches only a small part of them, it will have performed a considerable service. This book is written in a refreshingly well-balanced style and it deserves a similarly even-handed review. Weare never exaggerates a point or pretends to have found the Holy Grail. Instead; each argument is carefully counter pointed by a caveat. However the practising teacher may find this rather confusing because just as she thinks she had a lead, she is presented with the opposite side of the argument. This will surely dampen any enthusiasm to act on the idea and may be conducive to inaction rather than better practice in schools. The reader is well taken care of through multiple signposts such as overviews, chapter goals and constant summaries of basic points. Yet this also tends to underline its pervading abstract style and an inclination towards generalities instead of practical detail. For research purposes this style may be positive; for promoting classroom change it is not. Reading through the book one question came into my mind repeatedly: who is this book for? 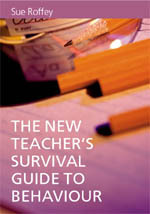 The title of the book might lead you to think that it is directed at schools and their staff. However it soon becomes obvious that it is pitched much higher – at Local Education Authorities, perhaps? I wonder whether this is the right place to be looking for lasting change. As a former teacher the authoress herself expresses her doubts on this approach by recognising that changes imposed from above fizzle out fast. It is clear that there was an onerous task of research behind the book. It is full of cross- references to investigation done in the different areas mentioned. Nonetheless, some teachers may feel that it lacks life, that there is no lively anecdote or story to back up the research quoted. The few “Real life” parts of the book purport to breathe spirit into the rather dull abstractions but never quite achieve that. It is certainly a compendium of research, a reference book on the topic, but live practice is not included. 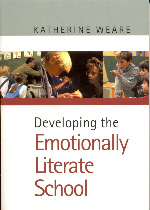 The title is very promising since developing emotional literacy in schools would be a welcome step forward educationally as well as for society as a whole. However the book doesn’t really ‘walk the talk’ as it asks others to do. It never gets down to saying how to effect this development in any detail. It is full of small, intriguing references which are quickly glossed over. Cases are cited like the Southampton LEA but no critical facts are given – how exactly did they go about it? What were the strong and weak points of the implementation? By remaining on the general, big picture level, the writer sometimes falls into the easy trap of talking down to school staff using the tired phrase, “… schools need to…” Instead of sermons, schools need concrete detail about how to go about change. Most teachers who read this book will be attracted to it because they already believe emotional literacy is desirable and here they will find their basic beliefs backed up. The E.L. approach will enhance learning, make schools safer, more attractive places and set a base for a better society. But those who are already convinced need blueprints for action, otherwise it is only preaching to the converted. Sep Meyer is a graduate of the London School of Economics and, since his retirement from a commercial life, has been devoting his time to a totally non-commercial activity, writing unsaleable poetry and unmarketable drama. Sandra Neilson is a committee member and regular walker with the Polytechnic Rambling Club whose activities may be viewed at http://www.polyramblers.org.uk. Tom Maguire has a BA (English), M-ès-Lettres (French) and Philology degree (Spain). He has 27 years experience in TEFL in France and Spain. At present he teaches EFL in a Spanish State high school near Barcelona.